With my job hunt now behind me I felt it was a good time to go back and analyze the psychology of looking for a job. As anyone who has ever been unemployed knows, it can be a very difficult thing to stay positive, no matter what is happening. When we moved back to Portland, I told myself that I should focus first and foremost on building relationships. As anyone in business knows, it's the people you know and relationships you develop that allow you to continue to grow both professionally and personally. Thankfully the people in Portland are fantastic in this regard. I never had a time during my search where someone wasn't willing to take 15-30 minutes out of their schedule to meet with me and answer any questions I might have. As I developed this network, I also did plenty of research into a variety of companies. While this helped me gain a better understanding of the market circa 2007, is also just raised more questions. Where did I want to work? What kind of company did I want to work for? What is inspiring me moving forward? 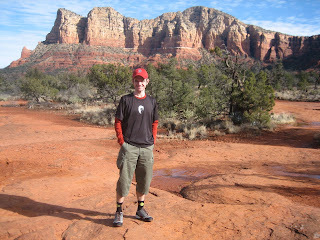 My contract position with Nike helped answer a lot of those questions. For me I realized that while Nike is truly an innovative company, I also determined that I'd rather my next position be with a smaller company (smaller than Nike is obviously a pretty large spectrum) and somewhere where I could utilize my penchant for analytics and new technology. Thankfully I've found that opportunity at Anvil Media. However, between Nike and Anvil Media was a fair amount of time. And during those 6+ months there were a lot of emotional lows and highs. Some days I'd jump right out of bed, step into the office and get right to work. Other days, I would stay in my pajamas, watch a TV show or do something else equally unproductive for portions of the day. So much of a person's self worth in today's day and age is related to his work (and it's so culturally embedded that even if you personally feel like it doesn't define you, it still defines you). When one doesn't have a job, you feel like you're missing a part of your personality. This is especially evident when you're a member of a professional MBA program. While my previous roles obviously allowed me to bring relevant work experiences to the discussions we had in class, a certain part of me felt that I was cheating my classmates and to a lesser extent myself. At the same time the positive support and counsel I received from those same classmates were a huge help in staying positive during my search. In the end I realized that the most important part of a job hunt for me was being comfortable in my own skin. Understanding who you are gives you a sense of comfort and additionally allows you to have confidence in your abilities. With this confidence comes a belief that the skills you have are desirable in the market and that finding a job is simply matching the right company with those skills. While my confidence certainly wavered at times, in the end it was being comfortable with who I was and my abilities that got me the opportunity at Anvil Media. 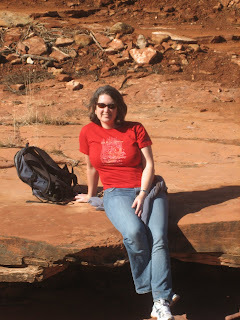 Between 2001 (my previous job search) and 2007, I felt one thing really helped me become more comfortable in who I was and allowed this search to be much different than the last. In fact, it is the reason this blog was started in the first place. Traveling around the world, being put in situations both easy and extremely difficult really helped me mature and made me understand who I was at a level I'd never really imagined. So by surviving 15 months on the road I was able to survive finding a job. Ch, ch, ch, ch, ch, ch... changes! With the search engine marketing boot camp that I'm currently undergoing at Anvil Media, there is a lot of information coming my way. The learning curve is steep but things are going well. One of the interesting things I'm working on right now is auditing web sites; getting a better idea as to what works and what doesn't from a search engine marketing perspective. So while I continue to learn how I can improve my clients and their websites, I decided that I should do the same with this little shingle of ours. We're starting small. As of about 20 minutes ago, we're up and live on our own branded website! Yep, Becca & Brian's Grand Adventure is now available at http://www.beccabrian.com/ Eventually I plan on adding other bells and whistles but with school and work, I figured this was a good start. The redirect should be complete in 3 days so when you have the chance, update your links accordingly! Despite rumors to the contrary, this was not any of the Davis clan after celebrating my brother's 30th birthday last weekend. Thanks to OregonLive.com for the fantastic coverage of someone who decided to try to take the short way home from Goose Hollow, a inner SW Portland neighborhood, through the light rail tunnel at oh... 4:30 in the morning. Methinks alcohol might have been involved. Needless to say, his efforts were met with an arrest and about $20k in damages to the line. While I applaud his effort to avoid the west hills of Portland, next time catch a cab. Or a nice comfy city bench. 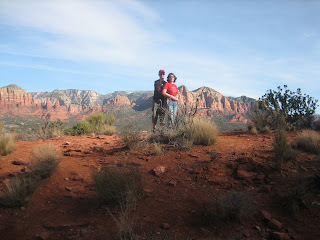 In time for Valentine's Day, a photo album from our romantic-ish joint bday trip to Sedona. I had to be down in Phoenix for work, so I surprised Brian by flying him down to join me for the weekend and heading up to Sedona. Neither of us had been there before, so we were eager to check it out. 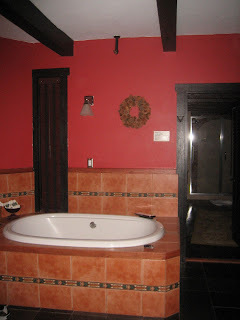 Because we were there in January (the absolute nadir of the tourist season), the trails were relatively empty, there were restaurant reservations to be had, and (best of all for us), the lodgings were all offering deep, deep discounts. This allowed me to splurge a little (instead of a huge lot) on a wonderful luxury (and gourmet!) lodge. 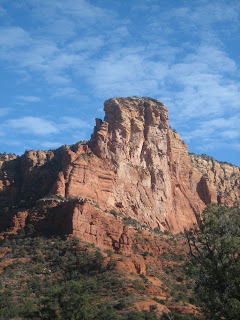 It was a great weekend full of relaxation and hiking and gorgeous views. 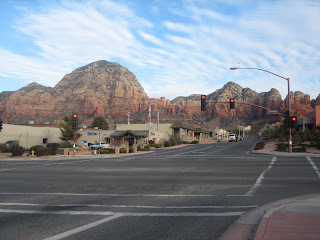 Typical street view. Except for mainstreet it's a surprisingly quiet, small, dumpy looking town, but all you have to do is look above the roofs for a great view. 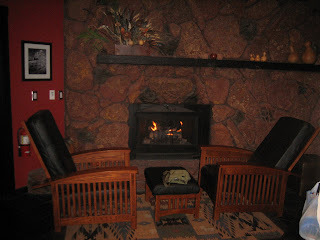 The most important part of our room at the lodge: our own fireplace and comfy chairs where we relaxed and did a bunch of reading. Comfy and fru-fru/schmancy bed. Funny story: Saturday night was the AFC divisional championships and we really wanted to watch the Patriots/Jaguars game. The only place we could see the tv was from the bed. 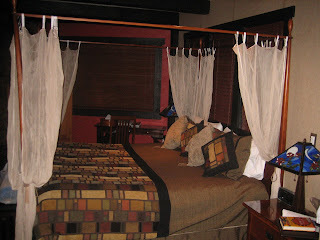 Thus we found ourselves watching the good old traditional masculine American pasttime while lying in a four poster bed with gauze/lace drapes and sipping red wine. The utter incongruity of it kept making us giggle. 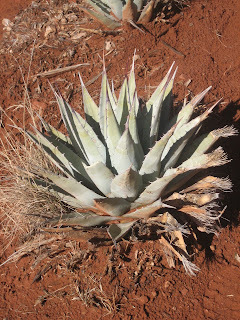 Almost hidden, the Lodge at Sedona's labyrinth offers its guests and the general public a unique on-site amenity. Constructed completely of local riverbed rocks, the labyrinth is classified as a " seven path classical labyrinth." a type represented in many indigenous cultures throughout the world. 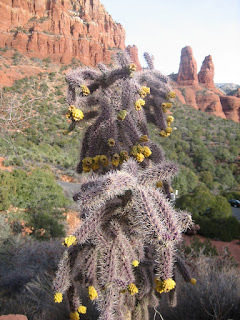 The design appears in Pima and Hopi Indian traditions in Arizona. The seven rings symbolize the seven sacred planets, the seven days of the week, the seven chakras of the body and the seven principles of the cosmos. 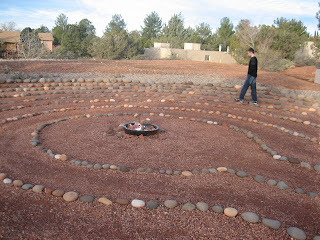 The center of the labyrinth is often regarded as a place of meditation and prayer. Brian and I had kind of pooh-poohed it, but since it was there, we thought we ought to check it out. Saturday morning we went for a walk before breakfast and entered the labyrinth. Now this is a labyrinth, not a maze. That means there's only one way in and out and it's not about finding the right way, but about following the path. I think we both felt a little uncomfortable/silly when we started walking through it. Were we supposed to be really serious? Should we be meditating? Did we look foolish? But an interesting thing happened as we walked back and forth along the curving and intertwining paths: we both got this strong feeling of calm and peace. When we met up in the middle we weren't quite sure what to say to each other. But we liked the experience enough that we made sure to give ourselves time to walk it again Sunday morning. Dorothy, I don't think we're in Kansas anymore. 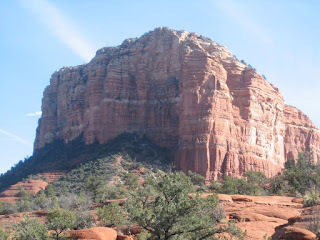 Bell Rock, one of landmarks in Sedona. 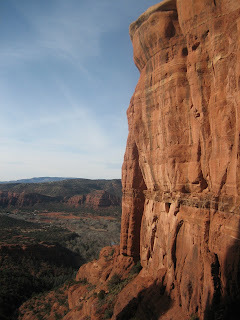 Many people climb it looking for the mystic energy vortices, but we were happy to do the loop walk around the bases of Bell Rock and Courthouse Rock (below -- not to be confused with Schoolhouse Rock). In addition to enjoying the weather and scenary we couldn't get over how reminiscent it was of walking around Uluru and Kata Tjuta in the middle of the Australian Outback. 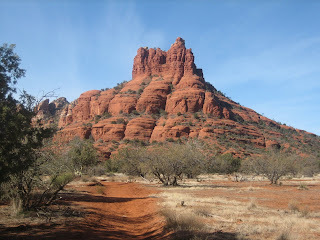 From the red clay under our feet to the deep red rock silhouetted against the blue sky, we felt transported back down under (we were just missing Jenny, Drew and the gang). At one point on the far side of Courthouse Rock it was perfectly silent and we just sat there and exulted in the peace of the wilderness. 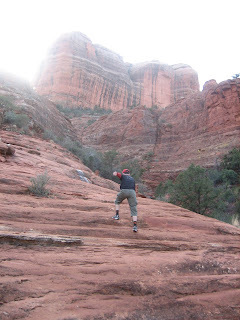 We had been mostly sticking to flat trails to take care of Brian's recently injured knee. 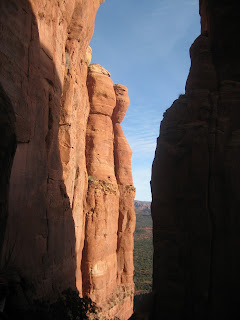 However we had heard great things about the view from Cathedral Rock so we decided to check it out. It was supposed to be a pretty short trail; how bad could it be?? 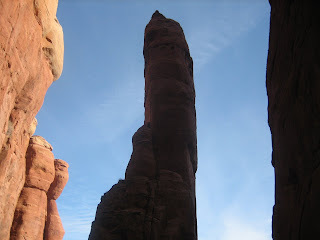 Yeah, well, it was pretty much straight up the rock. 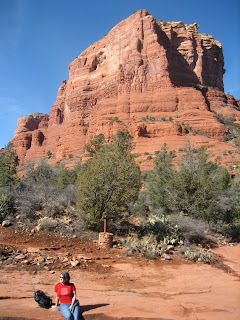 There was no trail as such, though there were some cairns to follow and mark the occasional carved steps. A lot of the time though we were just crawling up using our hands. Actually up wasn't so bad, it was down that proved to be more tricky. (Let's just say that butts were prominently involved). But the views were more than worth it. 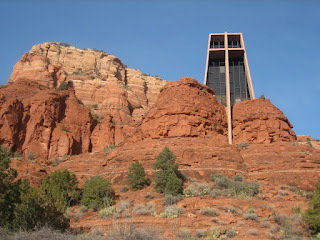 One of the more well-known attractions in Sedona is the Chapel of the Holy Cross (background info at the link). While obviously churches are not really my thing, I have been to few religious places that have moved me more (even filled with tourists). 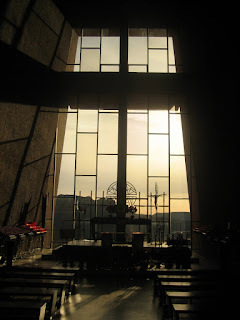 It seems a much more spiritual than religious place and is all about the wonder and beauty of the world. We both thought it was beautiful (and very photogenic). 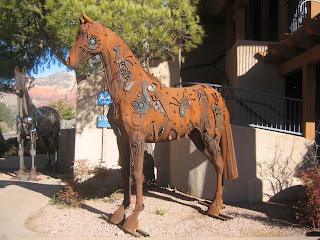 Sedona is also famous for its art. 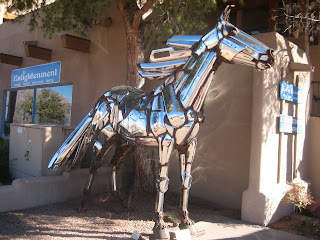 While we chose to maximize our time on the trails and so missed out on the gallery-hopping, I couldn't help grab these pics of some fantastic equine sculptures. Maybe Caroline can get something like these for the farm? All in all it was a great birthday weekend. 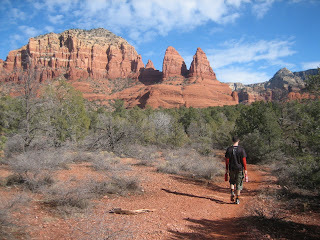 We only scratched the surface of all the walks, hikes, and activities in the area but we can definitely recommend it (at least in the slow tourist season). Back in my Minnesota days, I would bemoan my lot in life from a beer perspective. I'll be the first to admit that I'm a beer snob. Not a "reading the Beer Advocate" snob but after four years of living in St. Louis and drinking more Budweiser products than I could possibly imagine, I prefer the taste of a good beer. Having lived out in Oregon, I was used to a fantastic supply of micro brews all available as close as my grocery store. Imagine my surprise when I reached Minnesota. While micro brews were still available, the diversity of selection and ease of acquisition were both at a much lesser level than in the northwest. Imagine my surprise then upon my return to Minnesota. Our friends Alex and Seth had turned us on to Surly beer. Led by Omar Ansari, a former ultimate teammate of Becca's, Surly was just getting off the ground and at that point was only available in a few taps in town. Needless to say they've taken the beer world by storm (securing Brewery of the Year from the aforementioned Beer Advocate and even a mention in the WSJ) and while they are still only available in Minneapolis and a few select spots in Chicago, we have been lucky enough to secure a few cans for the Davis household. In short, they make damn good beer and I wish it was here. So despite being back in Oregon where I can find nearly any beer known to man, I find myself longing for that which I cannot have. I never thought I'd miss drinking Minnesota beers but with the emergence of Surly, I have to add that to the list of things I miss (All of our Friends, the State Fair, tailgating for Vikings games in subzero temps, etc.). So if you're ever in Minneapolis, look the guys at Surly up. It is worth the trip. And for the native Minnesotans, drink more Surly! Concept Car whose windows closed up when locked. The Safe Imagery is completed with this unique back door handle. My Brother's Dream Truck. I think it has actual horses inside. Me in my brother's second dream vehicle. This one has its own area code. Ahhh... that's more like it. I'm seriously contemplating one of these to get to/from work. Maybe I just like the idea of having a helmet and goggles. One of the vehicles from the Electric Car section. Unfortunately with a rate of 30 miles/charge we won't see very many of these on the road anytime soon. As the holiday season approached, I was asked what I wanted for the holidays (and subsequently my birthday) . Outside of a job (which I have since been able to get) I really didn't have anything that was on my wish list. However, during our travels I gained a semi-healthy obsession with garden gnomes. After finding our first one in Brugge, we saw them throughout the trip and whenever I had the chance, I took a picture. Evidently Becca, when asked about potential presents for me, mentioned gnomes as an option. Fast forward to Christmas Day. My Dad had me in the family gift exchange and in addition to a gift certificate for Beer Disneyland, I got a good ol' fashioned Garden Gnome. The jolly little fellow was a welcome xmas present and I was excited about adding him to the office until I could figure out an appropriate outdoor home. A nice surprise present. Of course, it was nowhere near done. Between Christmas and my birthday, I received two mini-gnomes and a gnome book from my mother in law, a garden "om" (a Buddha gnome) from my brother in law and his wife and the t-shirt pictured above from my lovely wife. So in two weeks I went from gnomeless to gnomelicious. After receiving all these gifts I, much like the Chinese, elected to give 2008 a proper designation. For the Chinese, 2008 is the Year of the Rat. For me, 2008 is the Year of the Gnome! The first day of work is in the book. No, I didn't just get home (in fact I'm currently in class) but I did have a busy, information filled day. I've already gotten my first client and am off to the races. Thankfully there are a lot of blog posts backed up in our queue and just begging to be posted. So while I get my feet firmly on the ground, you the reader still get fresh blog posts for the reading. As a sports fan, it always drives me nuts that there is more talk about the commercials than the game. However, after yesterday's thriller for once this might not be the case. That being said I did find myself at least having an opinion about a few of the commercials. So without further ado, in one man's opinion the best and worst of "The Big Game*" commercials. Somehow watching a person in a really blatant mouse costume (note the space between the head and body of the costume) lay the smack down on the creepy looking guy was really, really fun. Maybe the PBR had more of an effect that I thought. It does go to show you though that in some cases the amateur ads end up being as good as those done by the ad agencies. The group I was with was shocked when these ads came up. While I could go off about the racist nature of the ads, I'm equally as disturbed about the business sense of Sales Genie. Sales Genie has been quoted as saying that their goal was to make the worst commercials of 2008. While the "any publicity is good publicity" school of thought is usually appropriate, I can't imagine that getting branded as a trashy, racist organization by a large part of the general populace is where you want to be headed from a branding perspective. The other question to be asked is wouldn't the $4.8 million they spent on securing the ad space be better spent on something with a more discernible return on investment? Do they really think that people who need sales leads are going to call up Sales Genie after that? It will be very interesting to see what the fallout for this is for Sales Genie in the days and weeks ahead. I'm already serving as an enabler by linking to the ads. So enjoy the Doritos commercial and get back to work! * I will stick with The Big Game for fear of having the NFL copyright police knock down our door and force me to watch a 24 hour running loop of NFL pundits talking loud and saying nothing. So the Northwest has had an active meteorological week, with snow, sleet, rain, wind, hail and more and lots of schools and roads being closed. The damp chill pervades everywhere and leaves us longing for open fireplaces, warm blankets, and steaming mugs of hot chocolate -- or, at the very least, has us lunging for the thermostat. The bitter cold and dangerously low windchills between minus 35 and minus 50 degrees this morning caused scores of schools across Minnesota to call off school or start late. Windchill readings will remain in the teens and 20s below zero this afternoon across the Twin Cities. Even with the improvement in the windchill, exposed skin in today's conditions can still freeze in five to 10 minutes, the National Weather Service said. Um. Yeah. Right....... what were we complaining about again?? Sorry to run, but I'm off to go for a walk in our envigorating cool wet weather and give thanks for living in Oregon again.